Greece is receiving boat refugees in a daily increasing number (above 1,000 a day) and Italy (by it's coast guard) has even days of more than 4,000 a day (based on IOM data). So it’s save to say that annual flow of the boat refugees to the EU will rise to an far above 1 million a year level and maybe even will reach a level somewhere south of the 2 million number annual (plus take in consideration that this is a recurring issue/flow) (plus take in consideration that it’s an exponential growth issue/flow: year after year increasing in volume). The boat refugee problem should not become the next new huge problem for the EU that would lead to more internal problems. This is not a statement driven by any political flavour on this issue (we don’t have, we’re not that political flavoured, we’re more of the finding solutions branch), but by realistic assessment (we have). But there’s more to this: The North African coast is getting at fast pace an unsafe shipping lane (throwing this back into time 200 years: when these coasts where in the top 5 of global sea lane nightmares). This is threatening the trade/supply logistics of the EU each month more and more. It’s time for structural solutions. Fake solutions will only increase the problem. As is kicking the can down the road. What’s a structural solution? A solution that a) empowers the whole North African region economic, b) does that with at minimal cost, c) does that in a markets leveraged way, and d) delivers the European industries new areas of distribution/demand. How to do that? By using two forces/abundances of nature. Those two abundances are a) deserts and b) seawater. Merge them with the help of salt loving commercial crops (like salicornia: a salt water loving soy like protein/fat supplying commercial crop) and this ‘structured’ nature will do the job. It’s the cheapest way to deliver massive economic development to the whole North African region for/in ‘pennies at the dollar’ model. The market will pay for it / empower it / leverage it. More on it you can find on http://www.desertcorp.com and http://www.planck.org/publications/Global-Deserts-Exploration-Model and http://www.planck.org/publications/Global-Deserts-Investment-Model and http://www.desertcorp.com/slides/DesertCorp-Slide-Presentation.pdf and http://www.planck.org/downloads/Emerging-Nations-Desert-Development-PPP.pdf. Europe has an exploding immigrant problem, bigger than they could handle. Europe also has a protein production deficit. Africa has besides a young population just not yet the economy to serve these people. But Africa also has three yet not appreciated big advantages: deserts and access to sea water and has giant salt water aquifers. Why not combine those all and solve the mutual problems? To break down the above described basic economics in some nutshell lines in the realm of an Europe/Africa migrants solution: All inclusive investment per family farm is E 100,000, this is inclusive startup period finance that ensures the first 2 years of operation of the farm. The external investments (infrastructure and facilities) are also E 100,000 per farm. So the total investment is E 200,000. The equity demand is 25%, so E 50,000 equity needed. An average refugee/migrant family/unit is 5 persons. So the investment is E 10k per refugee/migrant. But: The host nations of course will demand something in return. Negotiations will start at the 'we do the same for your own population' negotiation position. But maybe they will demand more (even up to a 1 to 1 ratio: for each 1 refugee/migrant family 1 national family should have a farm too). This increases the equity demand per migrant from E 10,000 to E 20,000, so we'll not be that easy with that. And there will be some competition between desert nations do the demands of the desert nations will not be that big, as the outcome of those investments are too attractive for them. Note that this is an investment, this is not a cost. So the solution to the refugee/migrant problem can be done without costs. With as model bonuses: a) more rest/peace in the backyard of Europe and b) more turnover for European industries. Quite a paradigmatic change. Migrants who don't pass the education/attitude tests or who don’t want to become farmer can work at the construction or by facility companies. The migrant / domestic worker ratio is also something that will be used in the host nation negotiations. These workers will increase the tax base instantly: the workers will be paid national average wages and taxes will be paid on their wages. The host nations can demand import duties, but we will try to get an initial suspension of this (or it will be paid subordinated, as in woven it into the equity structure). So the solution to the migrant problem can be done without costs. Quite a paradigmatic change. For the peace lovers: This will stabilizes the North African and Near East region severely. Delivering the poorest 1 billion people an economic foundation in the middle of the deserts. In nations with a 75% youth unemployment rate, this is paradigmatic change for the better. For the green lovers: Exactly 25% of the greened desert area will be green nature (areas between the farms). It will make the mid of the Sahara (simply by the use of sea water and halophytes) a green paradise. It will cool down these regions severely (by evaporation: water evaporation demands a lot of heat). It will deliver rains to this part of the earth again. 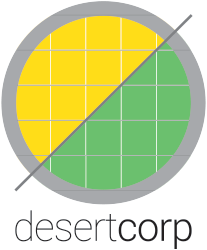 If you want to see the basic science behind salt water loving crops (halophytes is their family name) see http://www.desertcorp.com/documents/Potential-of-Salt-Agriculture-in-Scientific-American.pdf). Halophytes can secure Europe’s food security and structural protein production deficit in nearby regions. Not doing this will lead to increasing USA involvement in North Africa. I think we all shouldn’t want that: where these guys start to ‘structure’, the only result is failed states. This time literally in our backyard. These guys don’t solve anything, they are ideological blinded to assess the realm results of their efforts, they only multiply problems in their quest for maintaining their crumbling empire: It’s PR miracle that they still are able to ‘sell’ their ‘solutions’. They are talking about stationing their drone dead squads in the North African region: their recipe for destabilization would any realist doing some research say. The collateral damage caused by their drone programs leads to growth of support for terrorists and growth of refugee flows. See the refugee outflow of Syria towards the EU (just another natural gas pipeline driven conflict, nothing more, nothing less). The US has become unfortunately very good in destabilization. The last years of the American Century. The last thing the EU needs is more US involvement in North Africa. The result will be further destabilization and massive refugee flows (as proof of this: just one word: Libya). Doing nothing or achieving any other solution (from high density patrolling this huge sea area till offering nations an adoption fee) is far more expensive and thereby will be unrealistic in financial/fiscal terms. This is no longer about once ‘just’ 40,000 people (which already caused problems), this is about somewhere south of 2,000,000 people. Annual. No government has the fiscal funds for such voluminous flows. This is not about immigration. This is about making/doing immigration right. The solution described above is the only solution that a) performs (stabilizes NA, brings economic progress in NA and delivers huge new markets to the European industries) and b) is affordable (as the powers of the agricultural and financial markets will power it: it’s based on good economics). When the EC wants to realize this: let’s talk. Someone has to take the lead within the EC. The nations of North Africa will applaud it for sure too. This could become EC’s/EU’s success story, making paradigmatic change in the global perception of the EC/EU. The EC/EU need some successes right now. This is one that is being served to her ‘on a plate’. It just needs a choice. The rest can be taking care of.